Before getting into the review, I want to mention that while Blitz Room and Ex Libris were completed in the same visit, the Pre-room experiences differ. I have decided to review the experience immediately before each room. For example, before Blitz Room we were met by one of the owners in costume and in character, but didn’t spend time in the waiting area. Before Ex Libris, there were not costumes, but we got to observe the lobby and what they had to offer. The only element that I’ll point out again is to enter Next Level Escape visitors are required to phone in when they arrive in order to be let into the building. Next Level Escape is owned and operated by two young entrepreneurs who are very passionate about their business. Less than 2 months old at the time of our visit, Next Level Escape is already being noticed on the Sydney Escape Room scene. They have made the most of their space, and while the waiting area is quite small, and may be cramped for team of the suggested maximum of 6, the upside is that aside from signing the waiver, and waiting for anyone in the washroom, teams won’t spend much time waiting. Just don’t bring along anyone who isn’t participating. There are a few activities available to keep team occupied if they are waiting for whatever reason, and we were lucky enough to be able to tryout a puzzle that had been pulled from Blitz Room due to difficulty (and yeah, we solved it). After being led into the Ex Libris room, we received our story, from our interactive “Narrator,” and were off. Wow, the set design in this room was excellent! Everything fit in with the theme(s), and it was all aesthetically pleasing. The first room was a perfect introduction to the story, and each room added to our tale of escape while telling tales of their own. The literary worlds created for this escape room were noticeably diverse, and every single item that was included in each space added to the experience. We only encountered one technical issue that spoiled a surprise, though it was during a key moment. Aside from that, I honestly don’t know what could have made the Room Quality better than it was. A lot of the time it is hard enough for a room to immerse a group of escapees into one environment. Not only does Ex Libris succeed with one, it succeeds immersing its escapees into four environments. The story for this room kept us engaged and entertained, and we never forgot what we were supposed to be doing. The hints were given were provided by the narrator, who interacted with us while keeping his phrasing in line with the prose that he was “reading.” One element of this room that we found got in the way of Immersion at times was the fact that there is SO much to work with. At times it was hard to keep track of what had been used, what still needed solving, and what was obviously of no importance. The time tracking was also a little weird, fitting a 75-minute countdown into the 60 minutes of a standard analog clock. A great idea for the theme and well done for figuring out the technical aspects, but it was a little confusing for the escapees. Aside from these points, and the technical glitch I mentioned earlier, we were fully involved in our experience for the entire 75 minutes. The Puzzle Design in Ex Libris is of the highest quality. It is easy to see that the owners love creating their puzzles, and they know it is important to keep everyone involved. 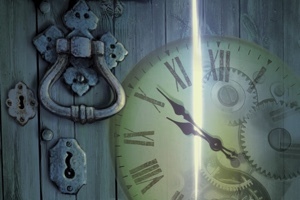 There are a lot of puzzles in this escape room, some of which are quick and simple while others are real humdingers, and there is a good mix of linear and open puzzles. Each puzzle aligns with the room theme(s), and even if you don’t enjoy the chosen theme(s), this shouldn’t hinder your enjoyment of the puzzle-solving experience. Another point of excellence is the appeal to the senses. As the name suggests, Ex Libris involves a fair amount of text, but also utilizes visuals, sounds, and tactile manipulations in its puzzles, appealing to a wide range of skills that escapees may possess. Again, with so much happening, it is quite easy to misplace pieces of some of the puzzles, and we had found some solutions already written on a few surfaces from a previous group. It didn’t impede us, and we completed every step of each puzzle, but some escapees may not react as well as we did to finding solutions. FUN? YES! Definitely give Ex Libris a try, but I would suggest you either go into it with a team that you’ve worked with many times before or with one person who is excellent at team leadership. There is a lot happening in this room; you have been given 75 minutes and you will use it, especially if you choose to complete all 3 tasks. Oh yeah, I forgot to mention that: Ex Libris provides its escapees with additional content to try if the main escape is too easy! This is a must for any group who wants the challenge, but don’t worry if the regular escape is what your team chooses to go for; it’s still a huge accomplishment! So, do I recommend this room? Do I even need to answer? YES! 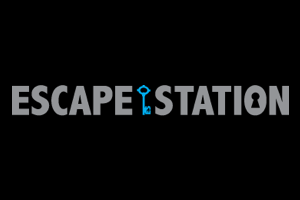 I definitely recommend this room to new and experienced escapees alike, though I would suggest that newbies bring a more experienced friend with them!